Imagine living in an underground home. You’re completely buried, just underneath the frost line. Inside the earth, the temperature is a cool and constant 55°F. One small heater is all it takes to raise your temperature to a comfortable 75° – year round, any season. Your heating and cooling bills would be almost nothing! But building such a house is problematic – there are issues with excavating, lighting, reinforcing, water seepage – in short, a nice idea but not very practical. What If We Brought The Underground Up? By running pipes in the earth, we can capture that constant temperature environment and in effect, bring it into your home! 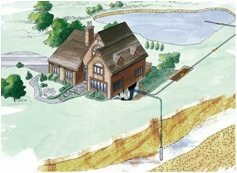 If you have excess heat in the summer, we pump it into the earth to cool your home. In the winter, we run cool water into the earth and warm it, then use that warmth to help heat your home. It’s like having an underground home above the ground! So Is This Just The Same As A Heat Pump? “Heat Pumps” usually refer to a very inefficient combined heating and A/C units which generally consume huge amounts of electricity in both summer and winter. Geothermal is very different. A small, efficient water pump circulates a closed-loop system of underground water or pumps an open-loop system. Heat is efficiently transferred to this constant-temperature loop, which can also be integrated with your hot-water system to increase efficiency even more. You will still use a small amount of supplemental heat from electric heating – but the geothermal system will instantly cut costs by 60-70%. 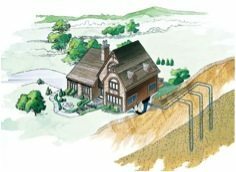 Why Has Everyone Not Already Installed Geothermal Heating and Cooling? That will be the question in the near future. Until now there have been technological and cost hindrances, but there are several factors that make this a great option RIGHT NOW!!!!!! One is the Tax Credit available for the new Geothermal installations. That’s 30% of your total install cost directly knocked off the top! There have been great price reductions and excellent new technological advances, in addition to substantial tax breaks. When the lower maintenance costs and the 25-30 year life expectancy is considered the result is HUGE savings that make the overall price of the system MUCH lower than that of a conventional system. The earth absorbs about 47% of the sun’s energy that reaches it, storing that energy in the ground. 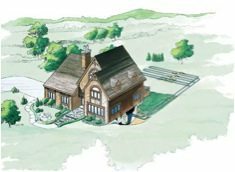 A geothermal system extracts that free energy for heating during the winter. For cooling, the system removes heat from the home and dumps it into the cooler earth. This transfer of heat energy is done through a series of pipes buried in the ground, or sunk in a pond, or by using well water. Because a geothermal system simply moves heat instead of burning a fossil fuel to generate it, it’s more energy efficient. 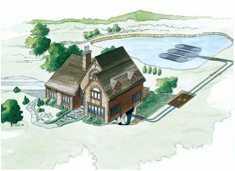 Geothermal systems can be installed with a variety of loop system configurations. “Closed loops” use re-circulated fluid in a series of pipes installed vertically, horizontally, or in a pond. “Open loops” use well water. One of the main reasons many homeowners choose geothermal is the benefit of lower operating costs. In most homes, the cost for heating, cooling, and hot water combine for about 70 % of the total utility costs. Therefore, the biggest opportunity to save a substantial amount in utility costs is to improve those systems. That’s where geothermal can help in a big way. For every one unit of energy purchased to operate a geothermal unit, it delivers four to five units of energy because the energy is free. A geothermal system is significantly less expensive to operate than ordinary heating and cooling. Geothermal systems can save up to 70% in heating costs, up to 50% in cooling costs.